﻿ : AmlPages.Com is a feature-rich application for managing documents, web pages, notes, passwords and other important information in a single place. Supports plain text, rich text and web pages, tables and figures, attachments, and many plug-ins for feature expansion. At any moment you can instantly record the important information in a sticky note, not looking up from the important cases. Aml Pages allows you to store absolutely any information in its database: texts, images, screenshots, files, URLs and etc. Moreover, you can store both links to files and files themselves. Have you ever thought “good idea, I must write it down somewhere” and then can’t remember it next day? Have you ever lost a sticker with an extremely important phone number? Now you have a solution for all such problems and more! The solution is called “Aml Pages”. It allows you to store all your important information quickly and easily. It helps you to organize it so that you can always find what you need right now. Information is organized in a tree structure – the most comfortable way to store and group this type of data. You can mark each node of the tree as you wish – you could change it’s font, size, style, and color. You can easily insert tables, links, pictures, dates, and times. URLs and mail addresses are recognized automatically and highlighted appropriately. You can capture and store a screenshot of any area of the screen directly from Aml Pages. Have you ever found a very interesting web page during surfing the web, and some days after can’t find it anymore? Or have you sent such a page to “Favorites” in your browser, but after some time can’t open it because “no such page on a server” anymore? Have you ever found very interesting web page during surfing the web, and some days after can’t find it anymore? Or have you put such page to “Favorites” in your browser, but after some time can’t open it, because “no such page on a server” anymore? Now with Aml Pages you could save complete web-page or its part by one hotkey pressing. Drag-n-drop technology is also supported – just drag selected text from any text editor or web-browser. You think that after short time you would get complete mess of data without any possibility to find out something? You are wrong! You like extensible interface? Or even would like to write your own extention? • Portable version: application does not require install and could be started from USB drive. • Back-up: autosave will automatically save all your data.lose your data. Flexible tree structure to keep all your notes in order. You can set up various attributes of node: colors, icons, fonts, sort order and etc. Text and paragraph formatting functions like in WordPad. Inserting tables and figures, hyperlinks and lines, date and time in any format. Insert hyperlinks, emails, addresses into text. All the standard URLs the Aml Pages highlights automatically and allows them to open a web browsers, email clients, and other applications. You can also capture screenshots of any area of the screen directly from the Aml Pages. One of the most "mighty" features of Aml Assist is support of dragging different stuff to its panel. You can drag some text from editors  MS Word, OpenOffice.org; whole web pages or their parts from all popular web browsers  Internet Explorer, Mozilla Firefox, Safari, Maxthon, Google Chrome. Can clip text from anywhere. Just select it and press the hotkey! It works in Microsoft Word, Internet Explorer, Outlook, Opera, Mozilla Firefox, OpenOffice.org, Acrobat Reader, Windows HTML Help and etc. Sometimes you need to find all parts of the document on any less formal terms: the date change, headings, notes, according to the type of data, etc. This will help you filter nodes: include any of the filters, and the tree will display only the topics that match the criteria. The remaining parts are temporarily hidden, without distracting you from the analysis. All your data remains intact. Simply do not need this other sections will not "stand out" in front of your eyes. Need a more complex filters? All settings are available: use any combination of conditions. Working with document in the filter, and need to navigate to the part of the document, not included in the filter? Aml Pages will automatically display it in the tree. If the user has moved to this part, then it is called for - and why it does not show right away? Filters - this is not a formal design, this is comfortable methods of working with the document. Bookmarks is the special navigation tool to any location of documents. Whenever you need to return to that place just open bookmark or hyperlink. You can easily create a bookmarks to a certain place in the document. When you are adding a bookmark, Aml Pages show insertion point and bookmark marker. Mark important text — interesting ideas and facts, imperfect text fragments that you want to come back later and etc. It is necessary to quickly locate a place of document. Check this snippet bookmark, and it will not be lost. Bookmarks show the markers in the text. Use any method for bookmarks navigation: toolbar button, context menu, text editor, or key combination Ctrl+Ctrl. Moreover, you can keep all bookmarks to various places in one pane, so you don't have to keep in mind where you should look for some important data. Sort bookmarks in any order: alphabetically, by date, by location in an text. You can create a hyperlink from any part of the document to the bookmarks. Create hyperlinks to bookmarks from other text and documents. The hyperlink can be from any other application, such as Web pages. The program supports advanced features for working with hyperlinks. You can embed links to other sections of the document and tags, URLs and emails, files and folders. Hyperlink to a section of the document or the label can be accessed from third-party applications and Web pages. Providing information security. 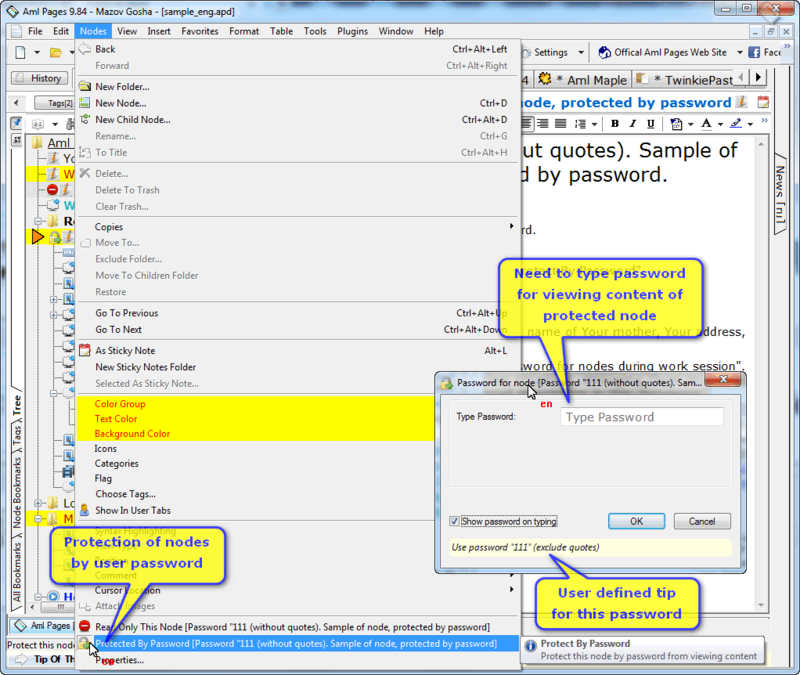 Aml Pages protects data by limiting access to the program with passwords. It is also possible to back up data. Aml Pages has built-in tools to automatically save changes as after a period of time, and when performing certain actions by the user. You no longer have to lose data, even if the computer freezes perfectly still. You can select a specific folder for the location and the maximum number of backups. At any time, you can create a backup copy of the manually or send a copy into external drives. When you save a document, this application will automatically create a backup copy of the previous versions. If you delete data by accident, you can always restore them from backup. A backup is password protected as well as the main document. So the idea of "dig" in the backups without your knowledge no lead nowhere. Copies are protected as the document itself. You can import both files and folders. Aml Pages supports the development of drag-n-drop. Drag files, folders, pictures, text in the application. At any time you can export a part of a document or a node in the tree of folders and files. 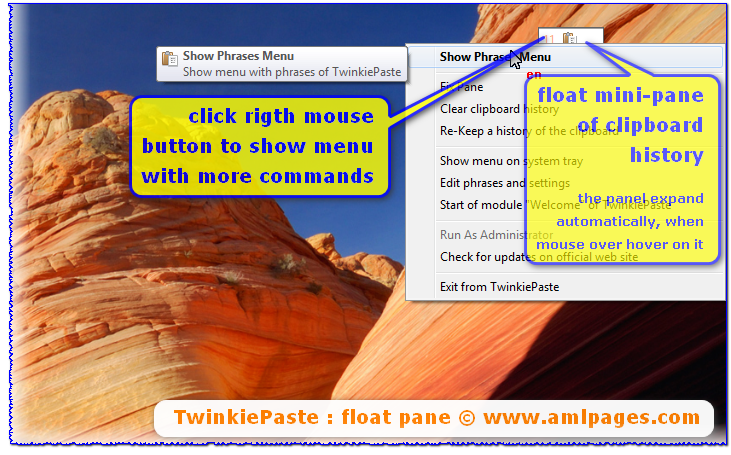 Create sticky note and easily save text to nodes by right click on Aml Assist pane. 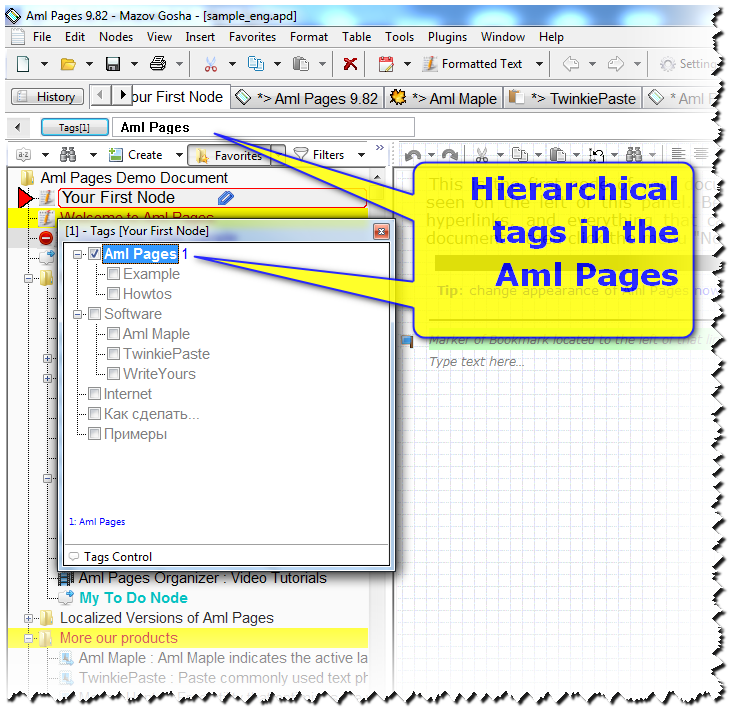 Aml Pages offers powerfull search in all parts of the document  individual nodes, branch or whole document with many options. Many search parameters can be set, for example - when data was added or updated, user nodes categories, data types, where search should be performed, search for whole word, including or excluding HTML code analysis and many more. You can view search results as a set of tabs that a virtual branch in the tree, or show in the tree only to search results. A quick search finds parts of document by titles. Well, of course, you can use a traditional incremental search with the button "Find Next" in text. Easy to use formatting styles can instantly draw the text at the appropriate sample. Click on the style from the drop-down list, and you're done - the selected text or the current paragraph is transformed: change color, fonts, formatting attributes. It took your style? It's easy! Format the text, bring up a similar form, and selects the "Create from the text. You're done! Use text templates for quickly insertion of frequently used words and phrases. Auto-completion helps typing quickly. This is trivial: you type, the application itself analyzes the text and offer you completion options. You can also add words manually. The application supports syntax highlighting of data formats, and many programming languages: e-mail letters, C++, Visual Basic, Java, HTML, Pascal, and many others. Plug-ins - these are additional modules that extend and expand the possibilities of the Aml Pages. Plug-ins solve many specific problems that are not implemented in the main program, due to their relatively rare in demand or specificity. Plug-ins offer an advanced export and import data, additional tools and opportunities to work with text. To install the plugin need only copy the file to the plugins folder Aml Pages. Aml2LeaderTask  integration with LeaderTask organizer. Aml2Dropbox  synchronize your documents via the Internet with web service www.dropbox.com. The most popular plug-ins already included in the program. Look at the menu "Plugins". Interface plugin (Plugin API) is open and documented. Many plugins are freely distributed (free) and open source. Storing all data in one place allows you to easily move Am Pages to other computers. All information will always be at hand wherever you are! You can easily customize any UI element under their habits. Remove or add the toolbar to change their location, add the necessary buttons in the panel, change the contents of the menu, choose your own icons. You can download localized version: English, German, Spanish, Portuguese, French, Russian, Ukrainian and etc. 1 Year of free updates. 50% discount for new versions after year.